Let’s continue with the Star Wars inquisition. 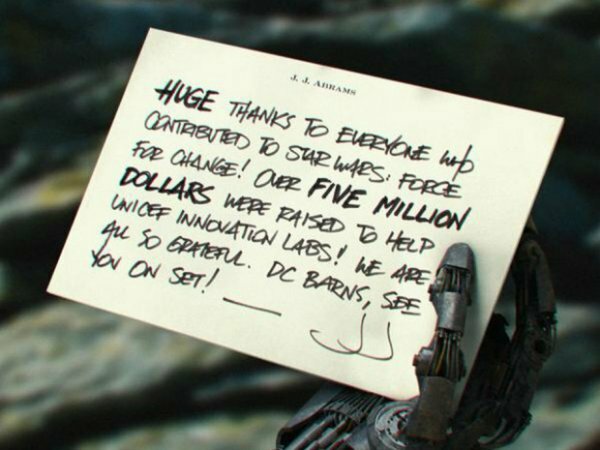 We have been collecting a ton of information regarding major characters in J.J. Abrams’ Star Wars: Episode VII. We ran photos of costumes we hear Han Solo will wear in different scenes. And we ran juicy details about who the new villain of the sequel will be (and how they will have ties to a very old villain). You might not have read this news yet, so I want to hide it behind a few spoiler warnings. He’s tall and thin and terrifyingly creepy, with glowing red eyes to match his red lightsaber. He’s got some robotic upgrades, like Vader – but no mask. The cybernetic bits weave in and out of him. He’s got a human upper lip, a steel jaw… and the robotic hand that JJ Abrams posted an image of." Wait, the hand holding J.J. Abrams’ note to the recent Star Wars Force For Change contest winner possibly belonged to this Sith Inquisitor?! And here we thought it might belong to Luke Skywalker. With all due respect to Indie Revolver, they are a new outlet blessed with a lot of insider Star Wars information. We have to take most of what is being reported online with a grain of salt (obviously), but the pieces snapping into place gel with most of the details that we have been hearing about J.J. Abrams’ production as it rolls along in London. The hardest part will be waiting for the finished film, which doesn’t arrive until December 18, 2015. Imagine how exciting it will be when Disney and Bad Robot actually share a teaser trailer? The Internet might melt.